Musings From Our House: Guess what's growing in our backyard? All that work that we put into our garden ... and this is what we find growing in the backyard (not in the garden!). Yep, that's right! It's a teeny tiny watermelon! Last summer, when our house was still under construction, we brought a watermelon out one evening. We paid no attention to where the seeds landed. Well, a couple of weeks ago, a little plant appeared in the middle of the dirt that we like to call "the backyard". (We haven't laid sod yet because of the watering restrictions due to the drought.) I thought it looked suspiciously like some of the vines growing in our garden and left it there. 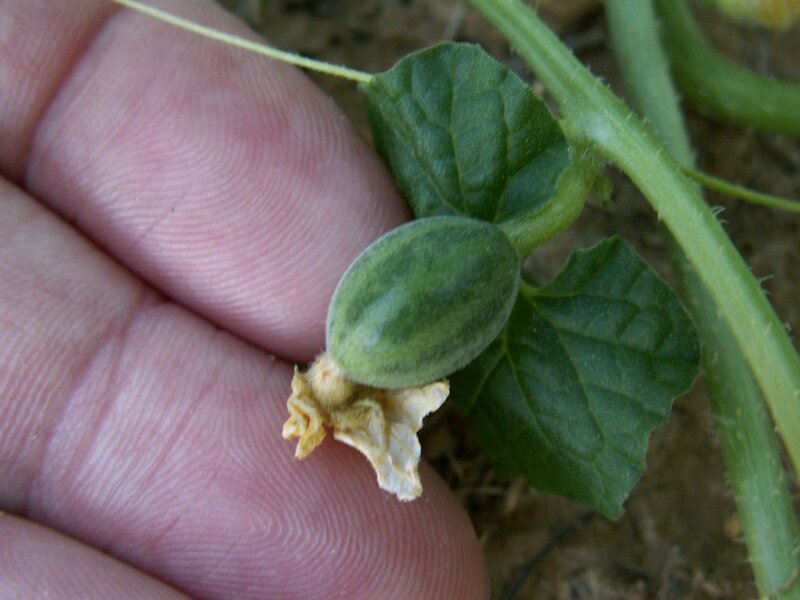 Sure enough, baby watermelons have begun appearing! We wonder if they'll be worth eating! Any tips out there on growing watermelon?